Where are you located. 120 for coilovers and 100 for spirigns if you want it done by me. before u worrie about how much, make sure!!!!!!! that they know very well what they are doing. 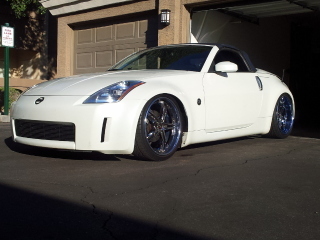 1st that they know the 350z, and also that they know the type of suspencion. i just had the worst experiance. Hi there, do you have an phone# or an email from this guy from tampa..
HI there, do you have an email or cell phone # of this guy from tampa? Spent an ENTIRE saturday, it sucked so bad that even tho i hate my KW V1s I refuse to take them off and replace them. Would I do it myself again?.... Probably. Simple to do, most shops do not actually know how to set them up. I charge only $200 for my local Vegas drivers. The rears take about 25min to install, fronts about an hour, and another couple hours corner balancing. Who is this guy? I'm about to buy some coilovers for my Z and might need someone to install them if a friend cant help me. I live like like 45 minutes from Tampa. Calculate the labor cost for your location by 3 to 4 hours and there you go. Don't forget to add the alignment cost. Don't know if this is the same guy you're all talking about, but there's a guy here in Lutz who did a diff swap for me a few years back. He's owns a Nismo and is a pro mechanic at Morse Cadillac. Call Jack @ 813-310-9406 Hopefully, that info is still current. 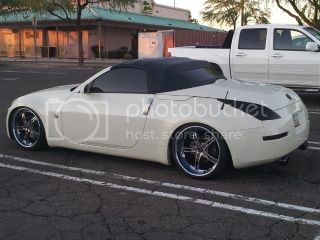 JUST GOT MY RIMS AND Ksports on the Z Roadster Did the coils myself they are not hard they are just time consuming. INstall isn't time consuming. It's not hard either. Definitely not worth paying someone to do. Especially considering that you're going to get hit with other chargers because it's a suspension component. You'd do yourself a favor by checking the DIY on it. Has nobody noticed this thread is from 2009? I'm sure OP figured things out by now. justin60222 posted a question about it as well. read the whole thread before trying to sound like a cool guy. Justin60222 is referring back to a 3 yr post, so my comment still applies. It also applies to the person who revived the thread.